Theresa May to renegotiate Brexit divorce deal: What's happens next? Britain's parliament has demanded that Prime Minister Theresa May renegotiate a Brexit divorce deal that the other members of the European Union say they will not reopen. Less than two months until the United Kingdom is due by law to leave the EU, the options include a disorderly Brexit, a delay to Brexit or no Brexit at all. That meeting is due to take place on Wednesday, with a source in his party saying Corbyn would tell May a no-deal exit must be taken off the table and she should pursue his party's "alternative plan" for Brexit. May's Conservatives do not have a majority in parliament and with many of her own lawmakers and the small Northern Irish Party which props up her government oppose her deal as it stands, so winning the support of Labour would help ensure she can get it through parliament. The meeting is not expected to result in a breakthrough. On Tuesday, lawmakers backed a symbolic call on the government to stop a potentially disorderly no-deal exit, sending a signal that most oppose such a departure. It does not bind the government but May said she would talk to lawmakers to discuss how that outcome could be prevented by securing a deal which parliament could support. 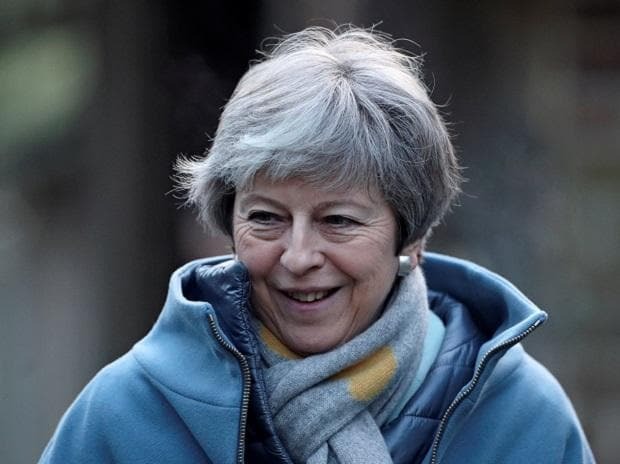 May also said she would engage seriously with a compromise plan put forward by Conservative lawmakers which seeks to draw a line under internal divisions that have so far prevented parliament approving a deal. May has said she will speak to the EU to seek the changes demanded by parliament, but she has no confirmed plans to travel to Brussels yet. EU27 ambassadors are due to meet on Wednesday to discuss Brexit, and May will speak to European Council President Donald Tusk by phone at 1745 GMT on Wednesday. On Tuesday Tusk said the divorce deal was not up for renegotiation. May said the government would bring a revised deal back to parliament for a vote as soon as possible. Before the previous vote, parliament held five days of debate but it is not clear whether there would be another lengthy debate before any subsequent vote. May said that if she did not bring a deal back for a vote by Feb. 13, she would make a statement to parliament and put forward a motion for debate on Feb. 14. Lawmakers will be able to put propose amendments to that motion. An attempt by Labour lawmaker Yvette Cooper and Conservative Nick Boles to give parliament the power to request a delay to Britain's March 29 exit was defeated by lawmakers on Tuesday, but Boles said he would renew that effort on Feb. 14 if a deal has not been passed by then. "We remain committed to ensuring that we don't reach the cliff edge on 29 March without a deal," Boles and Cooper said in a statement on Tuesday. May also said that if she brings a deal back for a vote and it is rejected, she will put forward a motion the following day which lawmakers will be able to propose amendments to. All EU leaders are due to meet in Brussels on March 21-22. There could be an eleventh-hour deal. Or it would be the last chance to agree an extension of Article 50 and delaying Brexit to avoid no-deal disruptions. If May does not get a deal approved by parliament by March 29, Britain faces a disorderly exit, or may be forced to seek an extension to the Article 50 negotiation period to give more time to reach an agreement. It is not certain the EU would agree to this. Some lawmakers, including Labour leader Corbyn, have said it is now "inevitable" that the government will have to seek an extension regardless, as there will not be enough time to pass the necessary legislation for Britain's exit before March 29. Last week the leader of Britain's lower house of parliament, Andrea Leadsom, said the date might need to be pushed back by a couple of weeks. The bloc will vote to elect a new European Parliament on May 23-26. The new chamber would get going from July 2, a date that is shaping up to be the EU's limit for any extension of Article 50. The EU says Britain would have to organise European Parliament elections on its soil if it were to delay Brexit beyond that as otherwise its people would be deprived of their democratic representation while still being in the EU. The bloc fears Britain would not do that. Some in the EU also fear that, should Britain vote, it would elect a staunchly eurosceptic representation to the European Parliament that is already expected to have a larger contingent of EU critics influencing the bloc's policies.